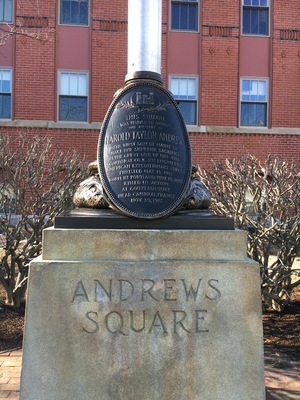 "Portland, Maine: Andrews Square Memorial"
IN THE GREAT WAR OF 1914-1918. A bronze plaque at the lower point of an American flag, mounted on a granite base. This monument, featuring a bronze plaque with ornate scrollwork, and two laurel branches, honors Corporal Harold T. Andrews, the first soldier from Maine to die in World War I. He was killed in action on November 30, 1917 near Cambrai, France. "Portland, Maine: Andrews Square Memorial" (2015). Cumberland. 2.